It’s safe to say that few people if any prepare for the possibility that their car might spontaneously catch fire or anticipate what will happen after the fact. Still, Stephani and Shaun Klamm say that they would have expected a bit more urgency from Toyota. Instead, the San Diego family tells ConsumerAffairs that Toyota has been surprisingly cavalier about a sudden fire that the family says nearly killed Shaun and the couple’s two children. The family’s ordeal started early in the morning on March 12. Shaun was on his way to take his two children to school when he thought he had forgotten his cell phone. They headed back to the house to look for it. As it turned out, the device had been in his pocket the whole time. Thinking that it was an electrical fire, Shaun grabbed his wrench. He opened the hood to disconnect the battery as fast as he could, but the electric components appeared fine. The fire, it seemed, was originating from the interior. Within thirty seconds, “the whole dash and the floorboards of the front of the car was on fire,” Shaun tells ConsumerAffairs. Firefighters with the San Miguel Fire Department said that the interior of the car was completely engulfed by the time they arrived. They extinguished the fire, leaving behind an SUV that was melted from the inside, and said the cause was undetermined. “The passenger compartment was totally involved upon arrival,” the fire department’s report says. 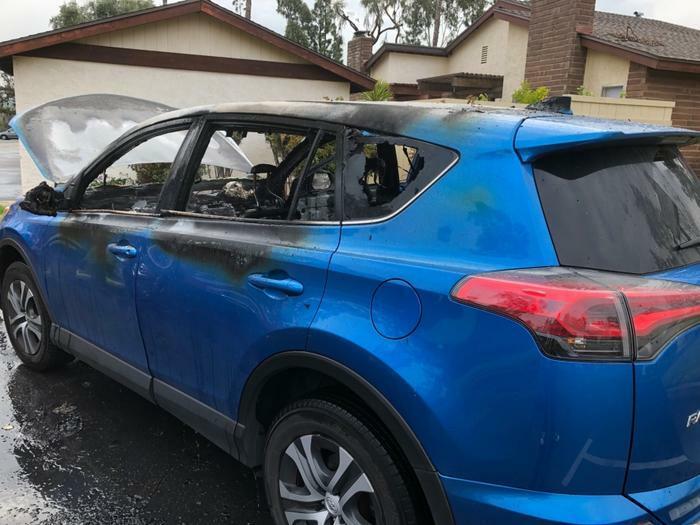 The Klamms are the second family in eight months to publicly share a story about a new Toyota RAV4 spontaneously catching fire. In both cases, the fire appeared to originate from the interior of the vehicle, rather than from the battery or the engine. Minneapolis couple Heap and Hayling Han told investigators last year that their Toyota RAV4 was turned off and parked outside their front door when it suddenly caught fire in the middle of the night. They called 911. A first responder was laying out a line when the car suddenly exploded, likely due to the fire coming in contact with the gas tank. The firefighter was hospitalized with minor injuries. Afterward, the fire department in Minneapolis said that fire was unlike any they had seen in a vehicle before. “Normally, the fires you come across, the engine is running or has been running,” a Minneapolis Fire Department spokesman told ConsumerAffairs last year. The fire was not intentionally set, they ruled, but the cause was left undetermined. 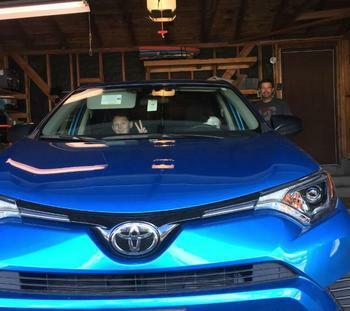 The Klamm family, meanwhile, purchased their own Toyota RAV4 brand new in September 2017, they tell ConsumerAffairs. It drove well initially. But lately, in recent months, Shaun suspected that something had gone haywire with the electronics. After a recent oil change, the car began acting “funny,” Shaun says. The high beams didn’t turn on when they were supposed to and the radio would turn on and off by itself. Shaun brought it back to the local dealership numerous times, he says, and couldn't get the electrician to look under the hood or take his complaints seriously. After the fire, the family’s insurer had the car towed and Stephani tried to contact Toyota. But the company’s customer service workers have been difficult to get ahold of ever since, she says. Toyota last week put a case manager named John A. in charge of handling the Klamm family’s complaint. But Toyota has not supplied the Klamms with John A.’s last name, his direct phone number, or his direct email address. Instead, Stephani says that John A. will try to call her once, while she is at work, and that when she returns the call, she is put on hold for lengthy periods of time. When she finally gets through to a person, it’s John A.’s receptionist. “We appreciate you taking the time to contact the Toyota Customer Experience Center,” says an email that John A. sent her last week, which Stephani forwarded to ConsumerAffairs. “We cannot accept electronic replies to this email,” the message says at the bottom. After Shaun finally got ahold of John A., he says the case manager accused him of trying to somehow benefit from the fire. “He said, What are you trying to get out of this?” Shaun recalls. Toyota’s press team tells ConsumerAffairs that they are currently “attempting” to look at the vehicle. “Since we have not inspected the vehicle, we do not have anything else to share at this point,” the statement concludes. After the Han family’s RAV4 spontaneously caught fire in Minnesota, Toyota sent an investigator down and told the family that the fire may have been caused by an improperly installed tow hitch. It was an explanation that the Han family didn’t believe. The Klamm family is adamant that they had no after-martket work done on their vehicle. “There was nothing after-market on that car,” Shaun says, adding that they even paid Toyota $900 for a new car alarm and $1,600 for a ten-year extended warranty.